The Qin Dynasty established the first empire in China, starting with efforts in 230 B.C. during which they engulfed six Zhou Dynasty states. The empire existed only briefly from 221 to 206 B.C., but the Qin Dynasty had a lasting cultural impact on the dynasties that followed. The state of Qin was located to the north of the Zhou Dynasty territory, serving as a barrier between it and the less civilized states above it. Qin was also considered a barbarian state by the Zhou. This distinction had to do with its slow pace in embracing accepted Chinese culture, for instance, lagging behind the Zhou in doing away with human sacrifice. Qin was created for Feizi, a son of King Xiao of the Zhou lineage, around 800 B.C. Feizi was in frequent conflict with the Rong people, who he conquered around 763 B.C., expanding Qin rule. In 629 B.C. Duke Mu of Qin sent an army to attack the state of Zheng, but it was ambushed and all members captured. This tempered Qin’s military ambitions for hundreds of years. 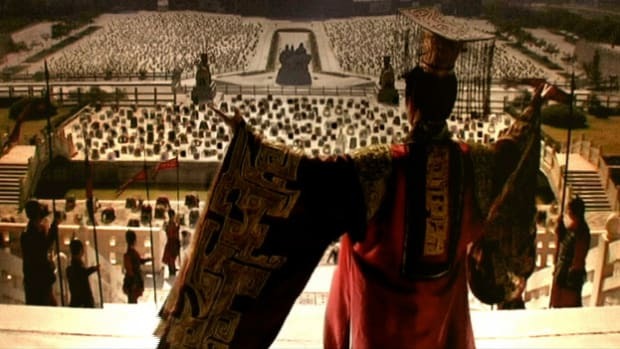 The ruling class of Qin believed themselves to be legitimate heirs to the Zhou states and through the centuries strengthened diplomatic and political ties through some means, including marriage. It was during the rule of Duke Xiao from 361 to 338 B.C. that the groundwork was laid for conquest, primarily through the work of Shang Yang, an administrator from the state of Wey who was appointed Chancellor. Shang Yang was a vigorous reformer, systematically reworking the social order of Qin society, eventually creating a massive, complicated bureaucratic state and advocating for the unification of Chinese states. 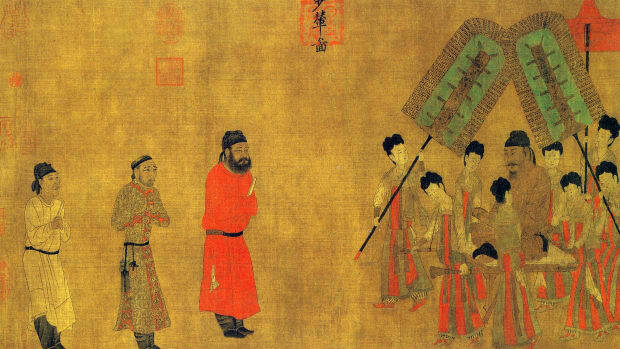 Among Shang Yang’s innovations was a successful system to expand the army beyond the nobility, giving land as a reward to peasants who enlisted. This helped create a massive infantry that was less expensive to maintain than the traditional chariot forces. 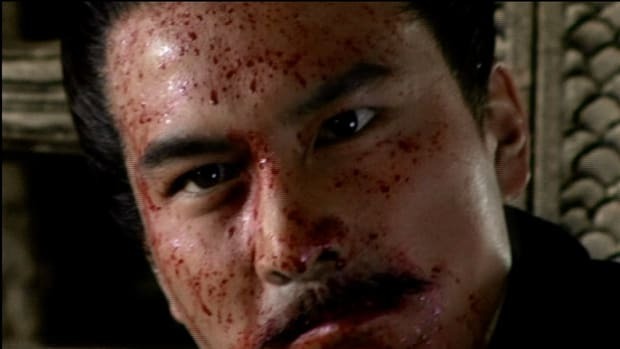 Following Duke Xiao’s death, Shang Yang was charged with treason by the old aristocrats in the state. He attempted to fight and create his own territory but was defeated and executed in 338 B.C. with five chariots pulling him apart for spectators in a market. But Shang Yang’s ideas had already laid the foundation for the Qin Empire. The state of Qin began to expand into the regions surrounding it. When the states of Shu and Ba went to war in 316 B.C., both begged for Qin’s help. Qin responded by conquering each of them and, over the next 40 years, relocating thousands of families there, and continuing their expansionist efforts into other regions. Ying Zheng is considered the first emperor of China. The son of King Zhuangxiang of Qin and a concubine, Ying Zheng took the throne at the age of 13, following his father’s death in 247 B.C. after three years on the throne. Qin Shi Huang began a militarily-driven expansionist policy. In 229 B.C., the Qin seized Zhao territory and continued until they seized all five Zhou states to create a unified Chinese empire in 221 B.C. 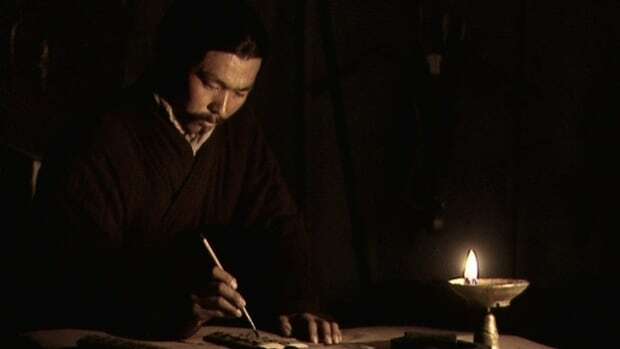 Advised by the sorcerer Lu Sheng, Qin Shi Huang traveled in secrecy through a system of tunnels and lived in secret locations to facilitate communing with immortals. Citizens were discouraged from using the emperor’s personal name in documents, and anyone who revealed his location would face execution. Qin Shi Huang worked quickly to unite his conquered people. 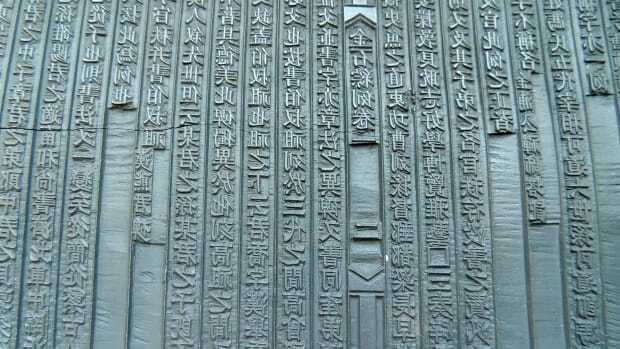 One of the most important outcomes of the Qin conquest was the standardization of non-alphabetic written script across all of China, replacing the previous regional scripts. This script was simplified to allow faster writing, useful for record keeping. The new script enabled parts of the empire that did not speak the same language to communicate together, and led to the founding of an imperial academy to oversee all texts. 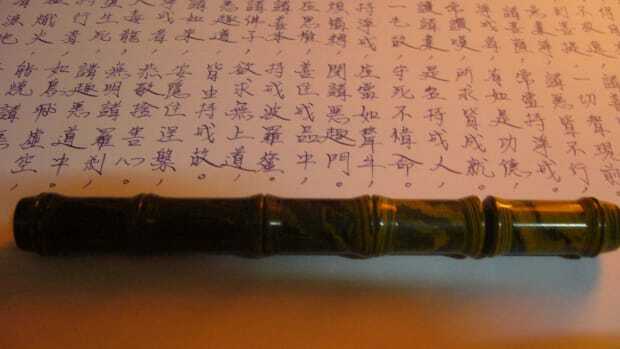 As part of the university effort, older philosophical texts were confiscated and restricted (though not destroyed, as accounts during the Han Dynasty would later claim). The Qin also standardized weights and measures, casting bronze models for measurements and sending them to local governments, who would then impose them on merchants to simplify trade and commerce across the empire. In conjunction with this, bronze coins were created to standardize money across the regions. The Qin empire is known for its engineering marvels, including a complex system of over 4,000 miles of road and one superhighway, the Straight Road, which ran for about 500 miles along the Ziwu Mountain range and is the pathway on which materials for the Great Wall were transported. The empire’s borders were marked on the north by border walls that were connected, and these were expanded into the beginnings of the Great Wall. Overseen by the Qin road builder Meng Tian, 300,000 workers were brought to work on the construction of the wall, and also service roads required to transport supplies. Qin Shi Huang was noted for audacious marvels of art and architecture meant to celebrate the glory of his new dynasty. 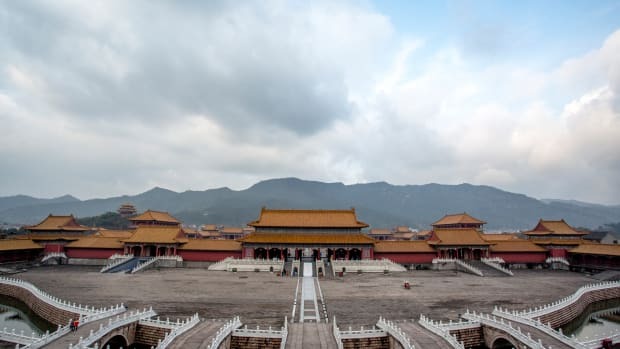 Each time Qin made a new conquest, a replica of that state’s ruling palace was constructed across from Qin Shi Huang’s Palace along the Wei River, then linked by covered walkways and populated by singing girls brought in from the conquered states. Weapons from Qin conquests were collected and melted down, to be used for the casting of giant statues. For his most brash creation, Qin Shi Huang sent 700,000 workers to create an underground complex at the foot of the Lishan Mountains to serve as his tomb. It now stands as one of the seven wonders of the world. Designed as an underground city from which Qin Shi Huang would rule in the afterlife, the complex includes temples, huge chambers and halls, administrative buildings, bronze sculptures, animal burial grounds, a replica of the imperial armory, terra cotta statues of acrobats and government officials, a fish pond and a river. 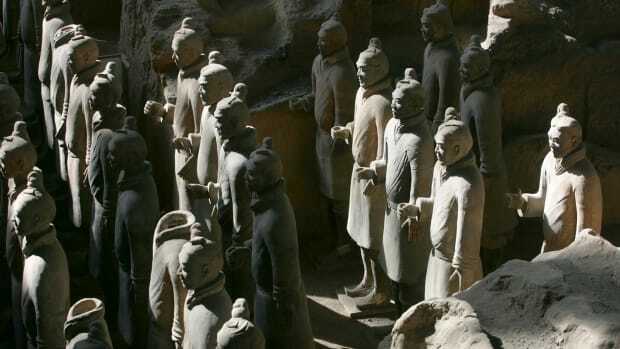 Just short of a mile away, outside the eastern gate of the underground city, Qin Shi Huang developed an army of life-size statues—almost 8,000 terra cotta warriors and 600 terra cotta horses, plus chariots, stables and other artifacts. 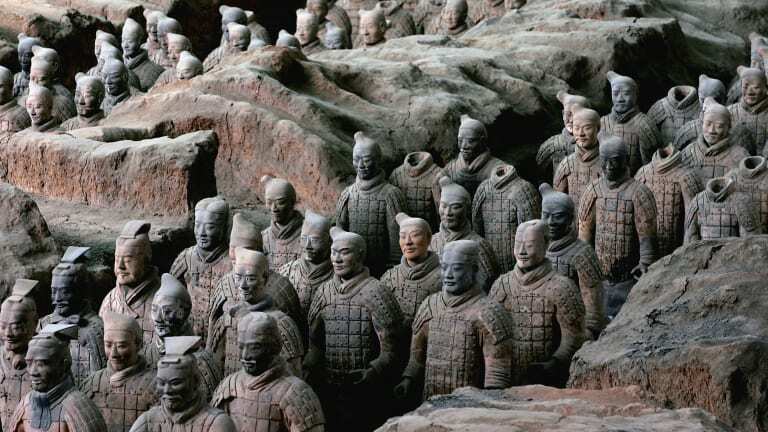 This vast complex of terra cotta statuary, weapons and other treasures—including the tomb of Qin Shi Huang—is now famous as the Terra Cotta Army. Excavation of the tomb of Qin Shi Huang has been delayed due to high levels of toxic mercury at the site—it’s believed that the emperor had liquid mercury installed in the tomb to mimic rivers and lakes. Qin Shi Huang died in 210 B.C. while touring eastern China. Officials traveling with him wanted to keep it secret, so to disguise the stench of his corpse, filled up 10 carts with fish to travel with. 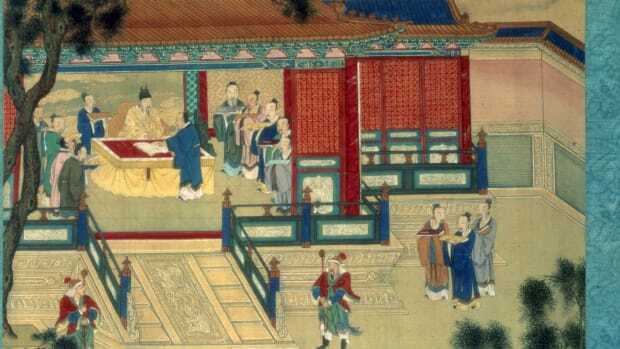 They also forged a letter from Qin Shi Huang, sent to crown prince Fu Su, ordering him to commit suicide, which he did, allowing the officials to establish Qin Shi Huang’s younger son as the new emperor. In two years time, most of the empire had revolted against the new emperor, creating a constant atmosphere of rebellion and retaliation. 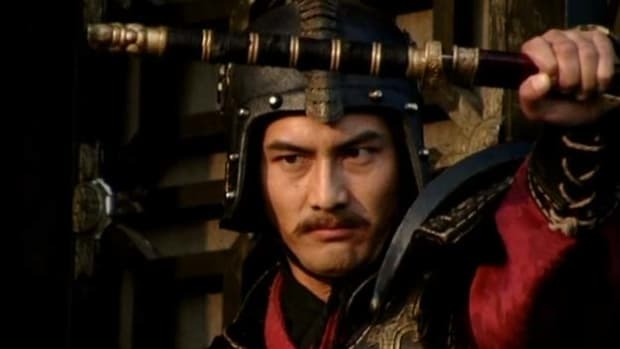 Warlord Xiang Yu in quick succession defeated the Qin army in battle, executed the emperor, destroyed the capital and split up the empire into 18 states. 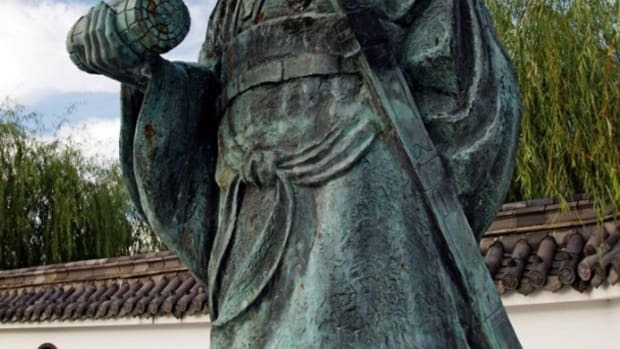 Liu Bang, who was given the Han River Valley to rule, quickly rose up against other local kings and then waged a three-year revolt against Xiang Yu. In 202 B.C., Xiang Yu committed suicide, and Liu Bang assumed the title of emperor of the Han Dynasty, adopting many of the Qin dynasty institutions and traditions. The Early Chinese Empires: Qin and Han. Mark Edward Lewis. The Dynasties of China. Bamber Gascoigne. Early China: A Social and Cultural History. Li Feng. Emperor Qin’s Tomb. National Geographic.